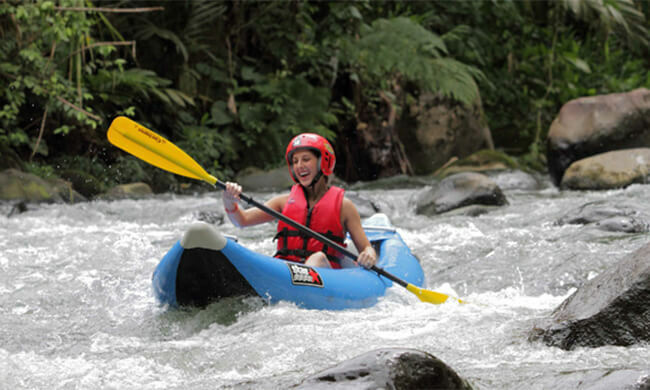 Build Your Own Perfect All-in-One Costa Rican Adventure Tour! The hot springs are the most famous feature, so plan to spend a good chunk of time there! You won’t regret it. Your lunch, an extensive buffet with all sorts of delicacies, is also included in the tour. Transportation to and from The Springs Resort is not included in the stated price but can be arranged. Pricing depends on the number of people in your party as well as the location of your hotel. Approximate tour times: 8:30 am, 10:30 am, and 12:30 pm. Tour lasts about 4 hours. You must arrange the departure transfer time with the hotel tour desk as soon as you arrive at The Springs Resort. What to bring: Bathing suit, change of clothing, long pants for horseback riding, rain gear, river shoes with heel strap, hiking shoes, sunscreen, and repellent. River shoes are available for purchase at the Outdoor Center at Club Rio. Tour of the jungle cat exhibit and wildlife sanctuary is available for additional fee. Ask your Travel Consultant for details.